Poppies will be on sale in school from tomorrow until 10th November. Your child/children will have the opportunity to purchase a poppy during the afternoons with all proceeds going to the Royal British Legion. It is advisable money is sent in to school in an envelope with your child's name clearly written on it and given to the class teacher/TA so that it doesn't get lost. 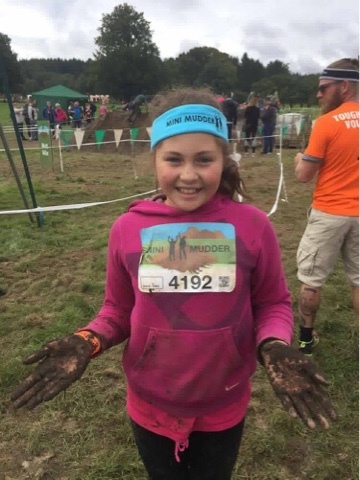 A massive well done to Rosie Thorne who is in Northern Ireland class. Rosie took part in the Havering Riding School Show on Friday, riding a pony called Lulu. Rosie won the speed jumping competition and got a special award for her Halloween costume-she dressed up as a witch. As you can see she received 2 beautiful trophies and 2 rosettes for her efforts. Well done Rosie! 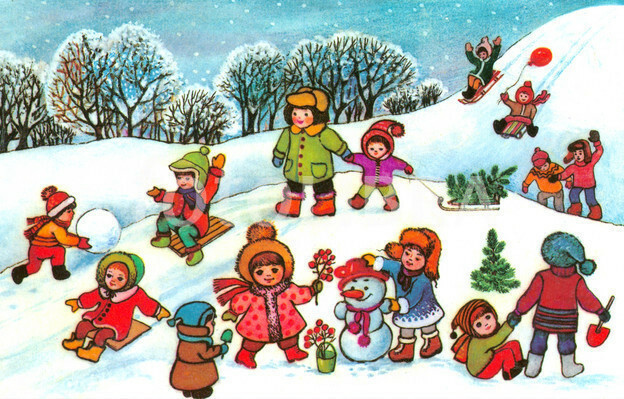 Write your own poem about a snowflake. 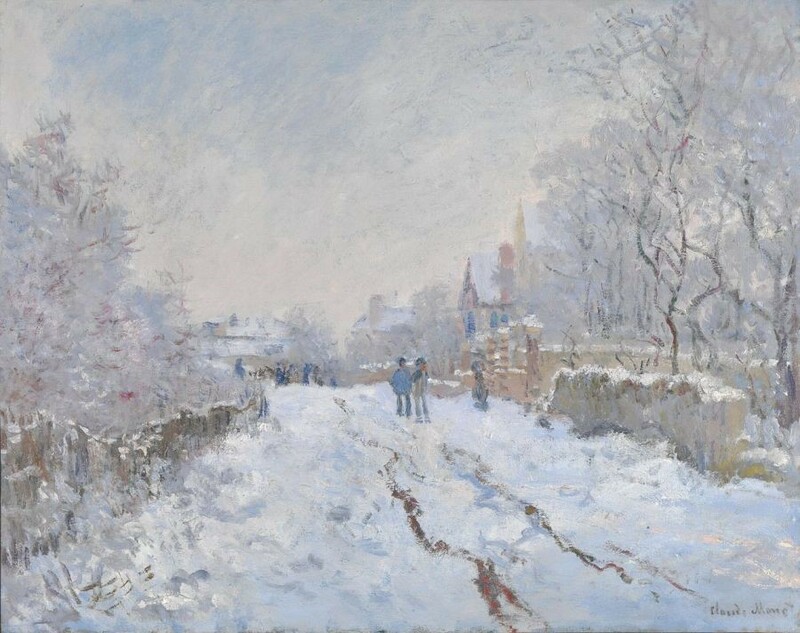 Make a copy of one of Monet’s famous paintings. Find out who this is and what he is famous for – tell an adult. Draw pictures to tell his story. 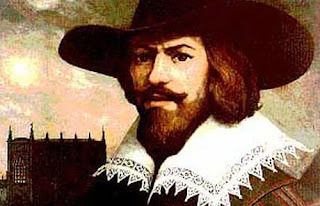 Write the story of Guy Fawkes. We are creating a winter wonderland role play area in Year 1. If you have any old gloves, scarves, etc that you would like to donate please send them in with your child. This is just to remind you that swimming for year 4 will resume today. Please ensure your child brings in their full swimming kit which includes a swimming hat. If your child has lost their swimming hat, you may purchase a new one for £1. 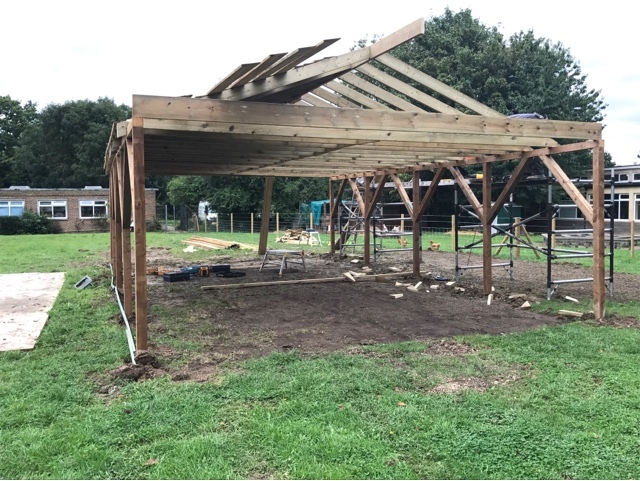 We know that the children will really benefit from the improved facilities as we continue to ensure that all Mead pupils have a world class environment! This is the final coop being installed into the farm area. Thank you to the Thames Chase Conservation Volunteers who have helped to construct all of the coops and get the area ready for the animals! Thames Chase Conservation Volunteers - Thank you! Thank you so much to the Thames Chase Conservation Volunteers. Their help and manpower has been instrumental in helping us to get the farm project close to completion. Without their labour we wouldn't have been able to have achieved so much in such a short time. 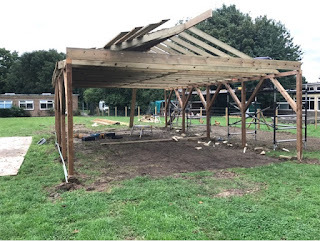 They have managed to move 30+ tonnes of Type 1, construct chicken and duck enclosures, install benching, trim the undergrowth and shrubs and lay the pathway for us. The TCCV Team have also helped us to create the duck pond and the planting around it. A great job - thank you very much! A huge thank you to Mr Kupriene - the husband of one of our Teaching Assistants - who gave up his Saturday to carve out the path around the farm. 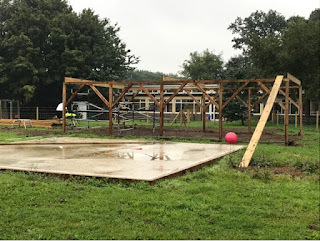 We want the children to have access to the different enclosures in all weathers, and the pathway will make the whole area much more accessible. Next we have the membrane to lay and then about 45 tonnes of Type 1 - and all of the timber edging. The path is expected to be complete by half term. We have been delighted to see how well the ducks have taken to their new environment. Having spent 7 days acclimatising to the new surroundings, they made a direct line to the pond as soon as the coop door opened. All of them were straight under the fountain, plucking and preening themselves in the water. They certainly have bags of personality - especially the lead duck with the fuzzy feathered head! He has already established himself as the leader of the pack. We're In The Paper: First day at school! We were delighted to see our Reception pupils featured in the Yellow Advertiser. They have all settled in really well and are already making the most of the outdoor environment! 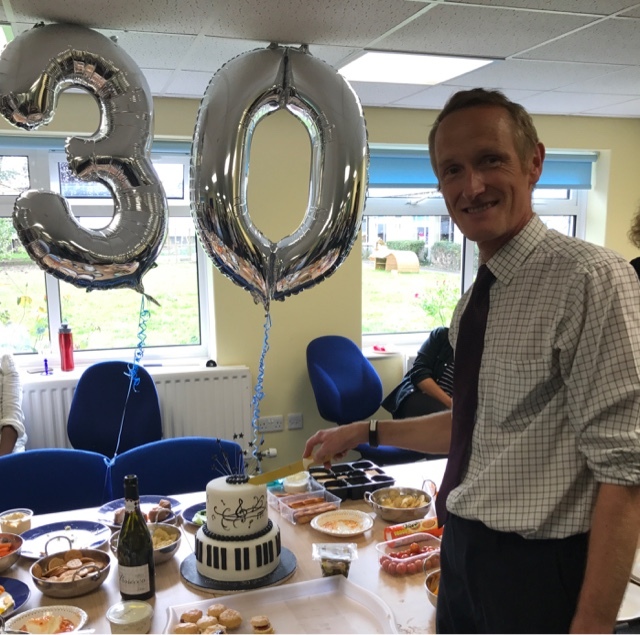 We were delighted ti have the chance to celebrate Mr Gower's 30 years of service at Mead Primary. 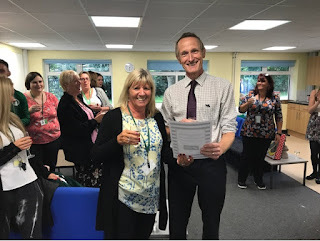 It is a great - and all too rare achievement - for one teacher to invest so much of their career in one school. 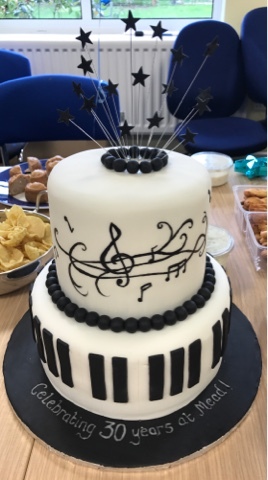 Countless children have benefitted from Mr Gower's passion for music. The response from pupils past and present has been quite overwhelming - which is fantastic to see. Thank you to all of the parents and past pupils who have made contact to express their best wished for Mr Gowers. The staff celebration with him was very special and we look forward to a few more years of Mr Gowers yet! 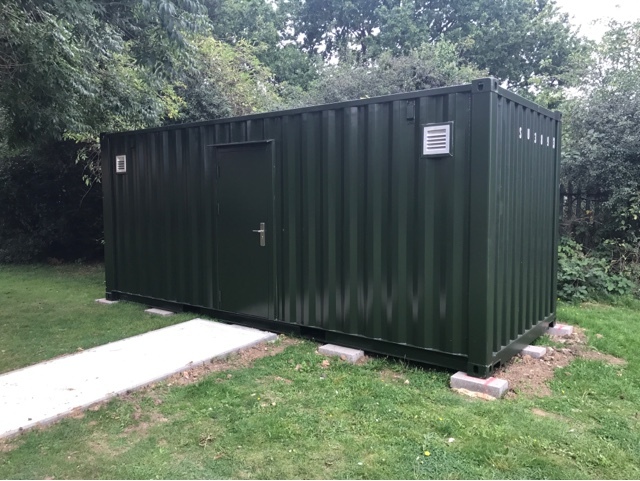 Now we have the container installed, we are able to take delivery of all the products and resources we need for the care of the animals. 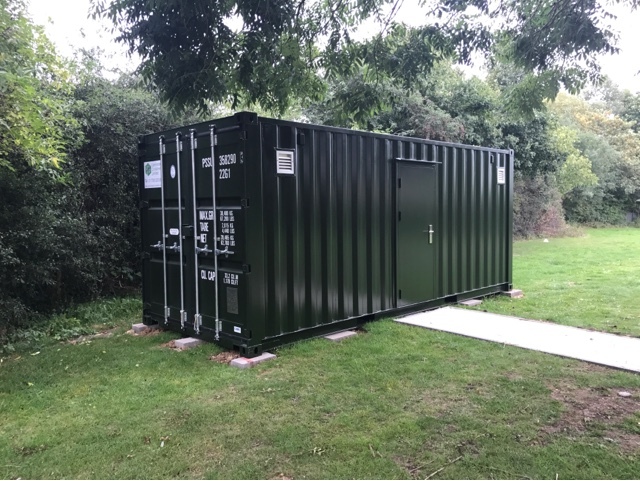 This specially modified container will allow us to store food, hay, medicine, cleaning products and all the other equipment required for the farm area. With this installed we expect the goats to follow in a matter of days with the horse and donkey coming by half term! 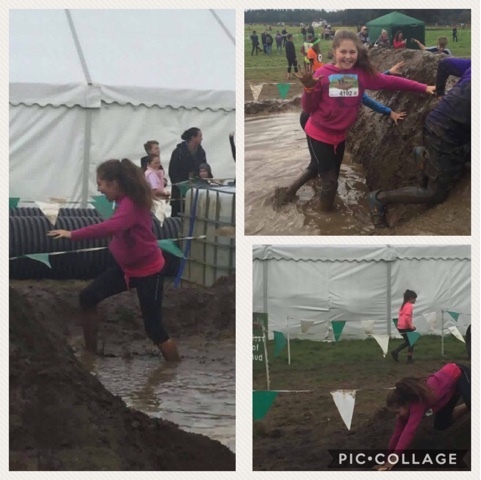 Well done to Tamara who braved the mud to complete a Charity Event at the weekend. Clambering through muddy puddles, climbing over mounds of dirt and jogging along a slippery path... Tamara absolutely smashed it! A great effort - we are very proud of you Tamara! We have now seen the outdoor classroom installed in the farm area. 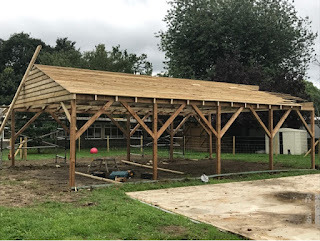 Now this is complete we can have the astroturf surface installed so there is a great all weather area for the children to go outside and spend time with the animals. Next up we have the pathways being installed and the final coops for the rabbits and ducks. 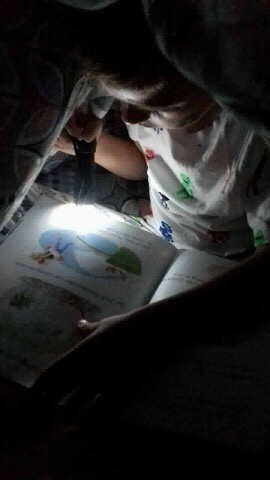 Alex has been extremely busy with his reading this holiday. Thank you for submitting so many different pictures! 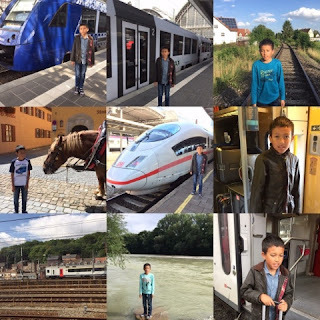 Ricardas travelling by train to Germany. 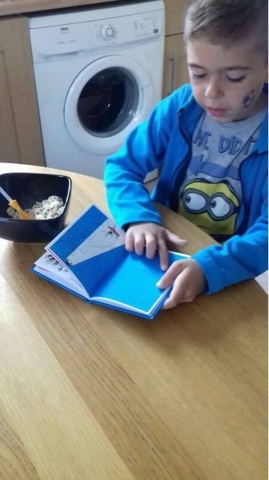 Thank you for sending in your pictures Ricardas and well done for remembering to take your book with you! Welcome back we hope you are all well rested and had an enjoyable half term. We will be starting a new topic this half term of Celebrations and Pattern, this is an amazing topic and the children usually thoroughly enjoy learning about the way different religions celebrate. We will start this term off by learning about Diwali this week followed by Guy Fawkes night next week. 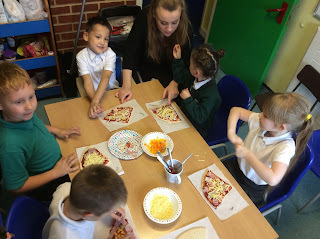 Later in the week we will be tasting some Indian food creating a diwali lamp and making rangoli patterns. We will continue the teaching of phonics, each week we will send home the sounds we have learnt, these are sheets for you to complete at home, to support your child. Please note they do not have to be returned to school. Begins to accept the needs of others and can take turns and share resources, sometimes with support from others. Can usually tolerate delay when needs are not immediately met, and understands wishes may not always be met. Initiates play, offering cues to peers to join them. Shows understanding of prepositions by carrying out an action or selecting correct picture. Questions why things happen and gives explanations. Asks e.g. who, what, when, how. Negotiates space successfully when playing racing and chasing games with other children, adjusting speed or changing direction to avoid obstacles. Experiments with different ways of moving. Moves with confidence in a range of ways, negotiating space. Shows interest in shape by sustained construction activity or by talking about shapes or arrangements. Can describe their relative position such as 'behind' or 'next to'. Remembers and talks about significant events in their own experience. Shows interest in different occupations and ways of life. Recognises and describes special times or events for family or friends. Imitates movement in response to music. Captures experiences and responses with a range of media, such as music, dance and paint and other materials or words. So one man flew away. 3. Find out about stars. Listen to the piece of music. Create some movements to the music. Draw an illustration to represent their feelings. 1. 1.Draw a portrait of the person. Please remember to send in P.E kits if you haven`t already done so as we will be starting to change the children for P.E. Staff are also available straight after school to discuss any concerns that you may have. 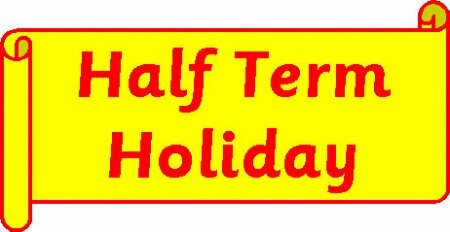 We would like to wish all our Reception children and their families a happy half term holiday. Please remember to save tickets, draw pictures and take photos of the wonderful things that you do together this week and stick them into your Special Moments book.Your child can then share their experiences with their class friends when they return to school. Have a lovely break and we will see you back at school on Monday 30th October. 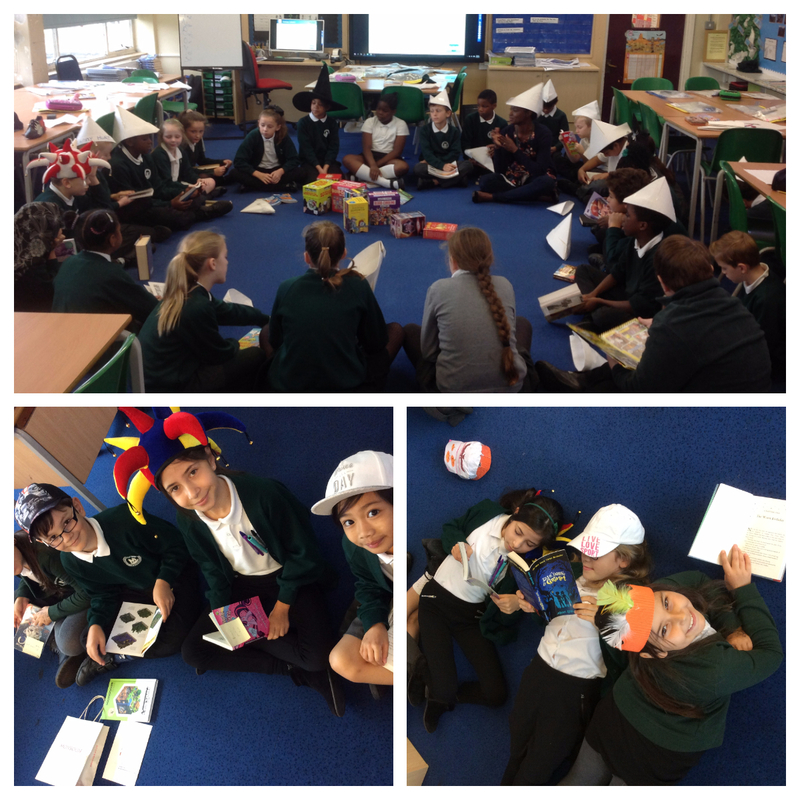 This morning year 5 celebrated reading! 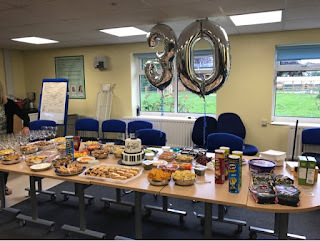 We held a 'book buffet' - getting a taster of many book genres and talked about our favourite authors and books. The children were engrossed in their books and thoroughly enjoyed getting a chance to enjoy a range of stories. They are excited to continue reading their favourite new finds over half term! The children wore their favourite hats as the theme was 'hats off to reading', in the words of Dr Seuss! Yesterday Year 2 had fun at the local Fire Station. It was an opportunity for them to see what it is like to be a firefighter. During our recent topic work about The Great Fire of London we looked at the role of the fire service in the past and how the Great Fire prompted improvements to the service. We also learned that Fire Fighters are not just called out to fires. 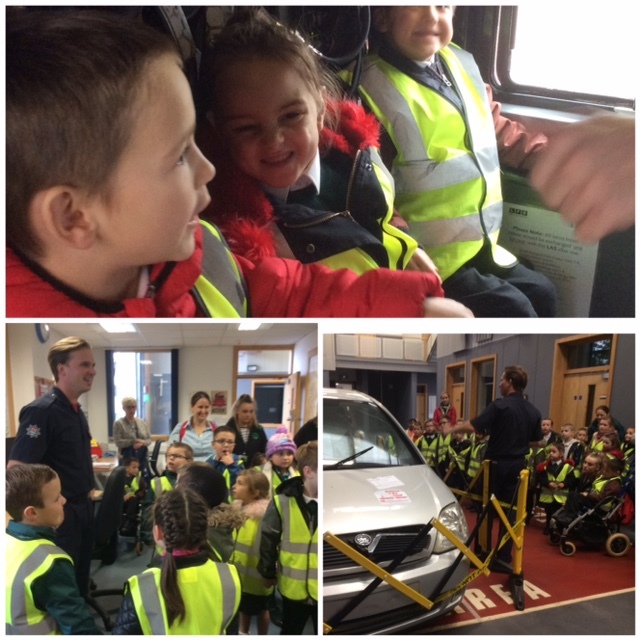 The Fire fighters spoke to us about keeping safe and what to do if there was a fire in our home. They told us how important it is to have a smoke detector. There is a number below to ring if you do not have a smoke detector and the fire service will visit you and fit one free of charge. We also looked around the station and watched how quickly the fire fighters slide down the pole to get to the emergency quickly and had the opportunity to use the hose! 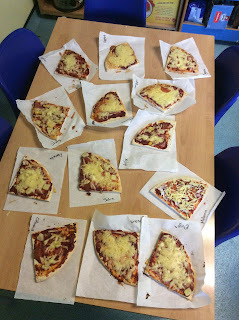 Perfect Pizzas and Tasty Bread! Do you know how much of each food group you should be eating daily? 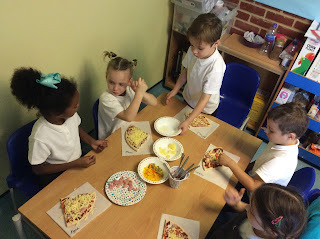 Year 2 students have been investigating how healthy pizza is. 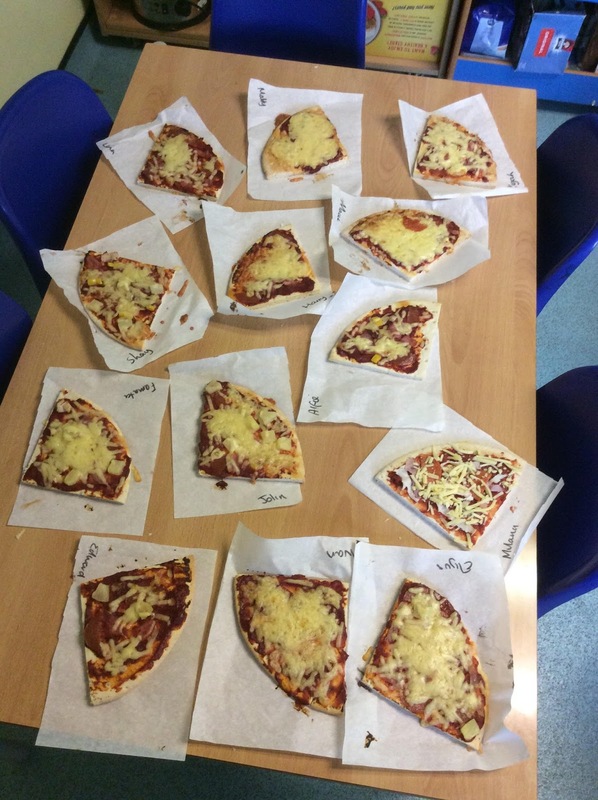 We had the option to look at our favourite pizzas before creating our own healthy version. Our pupils got to try different foods for the first time. These children have used a range of powerful vocabulary and techniques to become a Star Writer: Neve Smart, Maximilian Kondracki, Michelle Iancu, Tommy Croker, Harley Hallwood, Mariama Fati, Ayan Zahid, Alexa Dormer, Alishba Hussain, Grace Rowley, Vanesa Meskauskaite, Kira Staniforth, Aiden Wardell, Karla Nightingill, Bobby Perfect, Adedeji Okunoren, Joseph Wane, Jan Labedzki, Abigail Bradfield, Jack Whitehurst and Jack Stokes. Lucas Grigore, Ajus Kulsinskas, Hamit Colak, Logan Hallwood, Lexie Smart, Chloe Wooster, Mihaela Bordei, Amelia Nauthoo, Zehra Raza, Alexandru Ciobanu, Maya-Victoria Moliki, Agata Deptuch, Amelia Dang Nam, Giovann Alves Rodrigues, Alexandra Winjobi, Wahab Mudashiru, Amara Coleman, Courtney Wingrove, Alynniea Joyce, Nura Aboubakari, Hollie Hockley, Briana Grigore, Harvey Wettner, Aleena Seleka, Sophie Andreetti-Brown, Riana Dumitru, Raul Misinciuc, Kimarni Castleman-Creary, Franklin Burbridge, Biddy Clarke, Taha Hassani, Yakoub Idir, Luke Gurler, Jack Carter, Mihaela Plangu, Jessica Shorter, Ronnie Thomas, Rianne Bowers and Sumaiyah Shafique have been working hard at home and extending their knowledge through their learning challenge work. Well done to Aniyah Jackson, Fizzah Mohammed, Dylan Kennard who receive certificates for resilience and Charly Perfect, Lois Robinson who have shown they can be very resourceful in school. Year 3 prepare for a night in the woods!